Mickey Leland Preparatory Academy’s middle school and high school teams display their awards at the SECME VEX nationals with SECME staffer Anthony Bowser (center). Students (left to right) are Evert Guzman, Brandon Chuor, Danny Medina, Marcellus Jordan, Luis Torres, and Jarmel Brown. 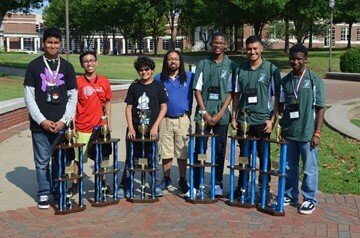 Mickey Leland College Preparatory Academy’s high-school robotics club won first place at the 40th annual SECME Summer Institute’s VEX nationals in June at Tennessee State University in Nashville, and the middle-school team took second place. This summer event brings together STEM educators and students for learning, collaboration, and dialog. This entry was posted in District II - Rhonda Skillern Jones, High Schools, Middle Schools and tagged Mickey Leland College Prep Academy on July 5, 2016 by HISD Communications. DiscoverU has increased the number of partnerships it has with HISD schools to seven for the current school year, allowing even more students to expand their horizons through foreign travel, college campus residencies, business internships, and more. This entry was posted in District I - Elizabeth Santos, District II - Rhonda Skillern Jones, District IV - Jolanda Jones, District VI - Holly Maria Flynn Vilaseca, District VIII - Diana Dávila, Global Education, High Schools, Summer programs and tagged Davis HS, DiscoverU, Eastwood Academy, Energy Institute, Furr HS, HAIS, Mickey Leland College Prep Academy, Sharpstown HS on October 22, 2015 by HISD Communications. A new school has at last earned an old tradition. On May 27, the Mickey Leland College Preparatory Academy for Young Men celebrated its first graduating class. The ceremony was held at Kingdom Builders Center and 18 seniors received their diplomas. This entry was posted in District II - Rhonda Skillern Jones, High Schools, New schools and tagged graduation, Mickey Leland College Prep Academy, Rhonda Skillern-Jones on May 28, 2015 by HISD Communications. Ten HISD students will be travelling to Israel this summer to experience life on a kibbutz. Every summer since 1980, the Mickey Leland Kibbutzim Internship Foundation has sent high school juniors who live or go to school in the 18th Congressional District to Israel for a month. Amber Wright and Tenaya Oliveras (Yates HS); Malcolm Edmonson (Worthing HS); Branaun Galentine (Wheatley HS); Genereux Nkundimana (Davis HS); Nahome Mekonnen (Leland College Prep Academy); David Valdes (Houston Academy for International Studies); Lizette Lerma and Pamela Banner (Carnegie Vanguard HS); and Jazzmin Sanchez (Reagan HS) will all travel to Israel June 6–July 4. The communal philosophy of caring for one another appealed to the late congressman. Following Leland’s vision, interns learn about life in a collective community and the diverse culture of the region, as well as work, travel and live in Israel. The program is organized, coordinated, and funded by The Mickey Leland Kibbutzim Foundation and the Jewish Federation of Greater Houston. This entry was posted in District I - Elizabeth Santos, District II - Rhonda Skillern Jones, District IV - Jolanda Jones, District IX - Wanda Adams, District VIII - Diana Dávila and tagged Carnegie Vanguard HS, Houston Academy for International Studies, Jefferson Davis HS, Mickey Leland College Prep Academy, Mickey Leland Kibbutzim, Reagan HS, wheatley hs, Worting HS, Yates HS on April 16, 2015 by HISD Communications.